You’ve booked the hot air balloon ride, and now it’s time to take amazing pictures. We’re sharing what you need to make fantastic memories. Are you an outdoor aficionado with a desire to take great photos on a hot air balloon? Every day, thousands of hot air balloons across the country lift off into the air, giving riders a perfect opportunity to capture stunning images while enjoying the experience. What’s more, there are no windows on a hot air balloon, so you can grab shots from any angle that pleases your eyes. However, taking great photos on a balloon requires the right equipment, good photography skills and a good understanding of your new environment. The good news is you don’t have to take a couple of flights to master the art of aerial photography from a hot air balloon. We’re sharing everything you need to know to know in order to return home with stunning photos after your first flight! Let’s get a few things out of the way. If you’re a ballooning newbie with a fear of heights, you may want to take deep breaths before taking off. Capturing truly unique views aboard a hot air balloon requires calm nerves. Feelings of anxiety or anticipation can impair your judgement and ability to hold your camera without shaking. Also, don’t expect any air turbulence, because balloons don’t fly against the wind. The basket is quite calm, a perfect ground for taking great photos. To achieve the best pictures, you need the right equipment. Just about any modern camera take great photos, but not all cameras can capture great pics on a hot air balloon. As such, a lot rides on the camera you choose for your mission. Although we’re not go to mention any specific brand or make, go for a camera that is light in weight but compact in shape. When it comes to features, look out for one with large sensors and interchangeable lens. That said, you don’t have to break the bank for expensive cameras, especially when you don’t take photographs for a living. You can find great, cost-effective alternatives online marketplaces like eBay. Hot air balloons usually cruise at an altitude of 2,000 feet, though high-altitude ones can go up to 5,000 ft or more. You will need a powerful lens to capture awesome air-to-ground photographs. Even though a 50mm lens works great for most altitudes, a 200mm lens is the most preferable when flying at higher altitudes. 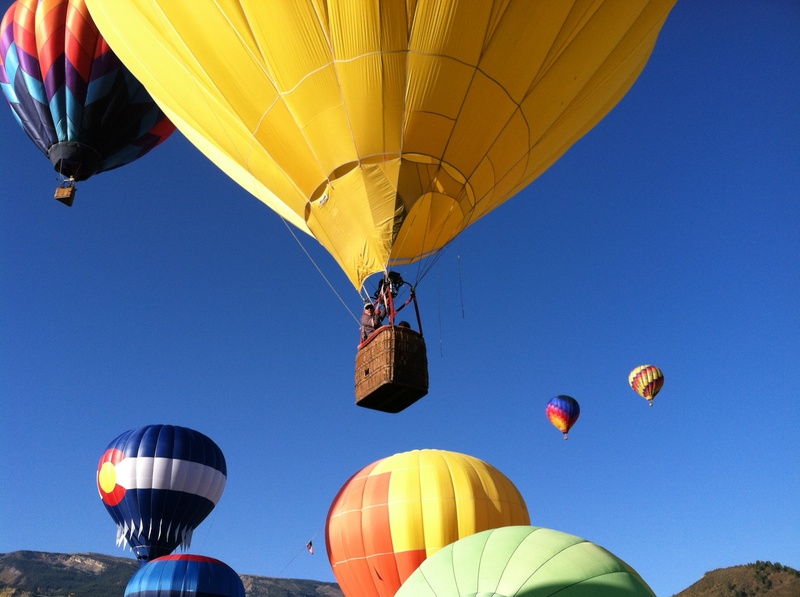 For some people, a hot air balloon ride is a once-in-a-lifetime experience. Even for frequent ballooners, every ride is a unique experience. This means you should be prepared to take lots of photos, and keep in mind there will be no time for reviewing and deleting the ones you don’t like. Yet, there is nothing more frustrating that running out of storage space when capturing shots of stunning landscapes from above. To avoid this, carry sufficient backup memory cards with you. Have you ever prepared to take a photo but somehow your camera failed to click away? This usually happens when you’re using a new camera that you aren’t familiar with. Before boarding the hot air balloon, ensure you’re familiar with your camera’s dials and menu systems. Learn how to adjust shatter speeds and light sensitivity, as well as how to swap lens quickly. You certainly don’t want to miss a chance to capture an amazing view because you can’t change lens quickly enough or get around the menu system. Smaller hot air balloons can carry 2-4 people, while the biggest can accommodate up to 14 people. If you book your ride in a balloon with several people on board, find a spot where you can freely take photos from various angles. To enhance your chances of getting the best spot, ask the pilot or someone who knows a thing or two about taking photos on a hot air balloon. Planning a photo shoot is vital to taking stunning images. Even if you’ve booked a ride across a place you have never been to, it pays to have a good idea on what you expect to capture. For example, if you’re flying across a game reserve, you should know the location’s interesting subjects. Go online and research about the place or ask your pilot what to expect. Either way, don’t board a hot air balloon and start clicking your camera right away. Take a few minutes to familiarize yourself with the conditions in the balloon basket, and then get your camera ready. Adding creativity to your photography can make a big difference when taking photos on a hot air balloon. Use the fact that balloons allow a 360-degree view to your advantage. While horizontal photos are the easiest to shoot, try different angles and find new ways to capture your views. For instance, if you are flying across a city with tall buildings, try taking down-facing photos. Remember not to move your feet when shooting. Unless it’s necessary, just rotate your waist to either side and capture the scenes. This helps you to avoid shaking your camera, something that can cause blurred photos. Use quicker shutter speeds in high-light environments, and slower shutter speed in low-light environments. If your ride is in the early-morning or late-evening, you can set your camera to a slower shutter speed even before taking off. Hot air balloon landings can be pretty hard sometimes. If you don’t secure your cameras and memory cards, they can be destroyed on landing, and you may lose your photos. Once the pilot has signaled passengers to prepare for landing, get off the camera and secure your devices. Cushion them with a protective cloth before tucking them firmly in your bag. Hot air ballooning is an awesome experience that enables you to get a new perspective of the world around you. Taking great photos of these perspectives requires proper planning, the right photography equipment, and a creative sense. Lastly, don’t get consumed by your camera. Take some time out to enjoy your balloon ride. Have you ever taken photos on a hot air balloon? We’d love to hear your experience! This Blog helps Aerogelic Ballooning tell you about great new experiences you'll find when you fly with us!